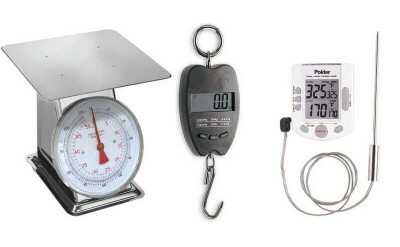 Scales are a must so you are assured to have the correct amount of meat or seasoning when making sausage or beef jerky. You will need a thermometer to be sure the meat gets to the right temperature during the cooking or smoking process. When you're preparing meat for processing or just weighing it out in portions for freezing, this Weston Products scale will ensure you get the exact amount you're looking for! 24-0302The easy-to-read dial measures from 0 to 44 pound increments. Stainless steel construction makes it easy to clean and..